I'm leading going into 2016!!! My lead is being whittled down every week though! anyone setting up a fantasy football league this year ? Think i finished 3rd in the wb.com fantasy league last year! Would be good to do it again. I'll be happy to set one up a little closer to the start of the season. have we set up a fantasy league on the official Fantasy football league site yet for us West Brom . Com people?! If not, I'm happy to do it and post it here, but i don't want to tread on toes if someone has already done one? If one exists, what's the code? Like I said I am happy to do one but was going to do it closer to the start of the season (the lack of signings for us was depressing me). Knave can you put a link to the site we are using please. Sign up and lets see what we can do! cheers mate will do it after work tonight. Thanks for setting up ! Im in the classic league as For Fucks Ake. Will leave the other league to the more established members of this forum to join, however looks liek a lot of fun so if not up to 20 people by start of season i will join. Also making the team this year was the hardest its ever been - so hard to tell how some of the new managers are going to fare / set up their teams. There's a lot more of high priced players with Leicester having won the title. 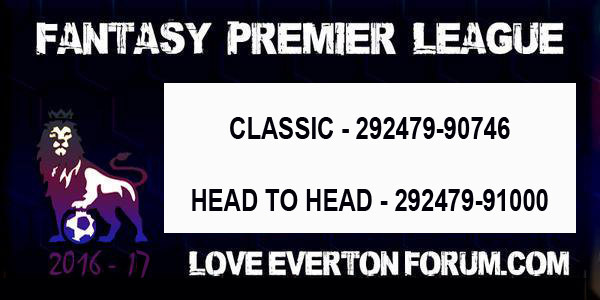 Two weeks to go, if you've not joined the Head to Head league yet, do it. If we don't have 20 players by the start of the season the fixtures will be odd. Get involved, it'll be a laugh. Last call. Less than a week till the kick off, 14 teams in the main league (good going guys) and slightly less in the head to head. If you're not in that yet sign up. Hi Baggies, and hope you're all well. Every year we invite our Prem friends to take part in our fantasy football leagues, so please feel welcome once again this year. All the very best, and good luck for the season. I think you meant to post your forum link with all the letters in lower case . We've 22 people in the main league (brilliant, well done all!) and only 12 in the head to head. Can people fill those places? It's limited to 20, but it'll be fun. Cheers all and good luck for the new season!